I am constantly reminded of my ‘European-ness’. I lived in England for three years and have been happily settled in Scotland for the last year and a half, and while there are some habits I have happily adopted – such as eating baked beans on toast, watching British and Irish comedy shows, and some colourful Scottish slang words, of course – there are some European traits I just can’t leave behind. My veneration of food is – obviously – the biggest one. I must have meals at the proper times. I always have an afternoon snack – what in French we call un quatre-heure (a “four o’clock”, not that you have at that specific time). I feel comfortable drinking alcohol any day of the week, even at lunch time, because that’s OK in Europe so long as you don’t get trolleyed. I see chocolate as a totally appropriate breakfast food ingredient. And I can’t live without Speculoos. The Americans have their peanut butter, the Brits have their Cadbury – Belgians have Speculoos. Long-time readers of my blog will know what I’m talking about, but for those of you who don’t, let me explain: it’s a cinnamon, gingery type of biscuit (the British type of biscuit; a crunchy cookie) which is available in shops year round and is a beloved snack, but features most prominently as a celebratory treat during St Nicholas’ Day, on the 6th of December. If they’re not available in your country, don’t worry: I recreated the recipe for this heavenly biscuits on Keepin’ It Kind. I’m having tons of fun filling chocolate cups with all sorts of fillings (expect to see a lot more coming to the blog!) (oh and check out these pistachio matcha chocolate cups from My Darling Vegan), especially now that Easter is around the corner; filled chocolates are my favourite at this time of year. Cookie butter (as it’s known in the US; Speculoos spread anywhere else) just seemed like a no-brainer to me. Place a small saucepan over medium heat and add the coconut oil and milk to it. Wait for the milk to be warm before adding the chocolate chips. Stir continuously until evenly melted, then take off the heat. Set aside the chocolate to cool. When it is cool enough to dip in a finger, but still warm enough to be liquid, pour 2/3 of it into the bottom of 8 cupcake moulds. Swivel the moulds around to coat the sides, all the way up to the top. Place the moulds in the freezer to firm up, then make the cookie butter filling. Blitz the caramelized biscuits in the food processor or blender. When they have reached a fine powder-like consistency, add the remaining ingredients and blend again. After a few minutes, the mixture should be thick and creamy, with no lumps remaining; in other words, it should be like cookie butter. Spoon the cookie butter into the cupcakes moulds, over the firm chocolate base. Smooth out the top, then cover with the remaining chocolate. Place the cupcake moulds back in the freezer for another hour. 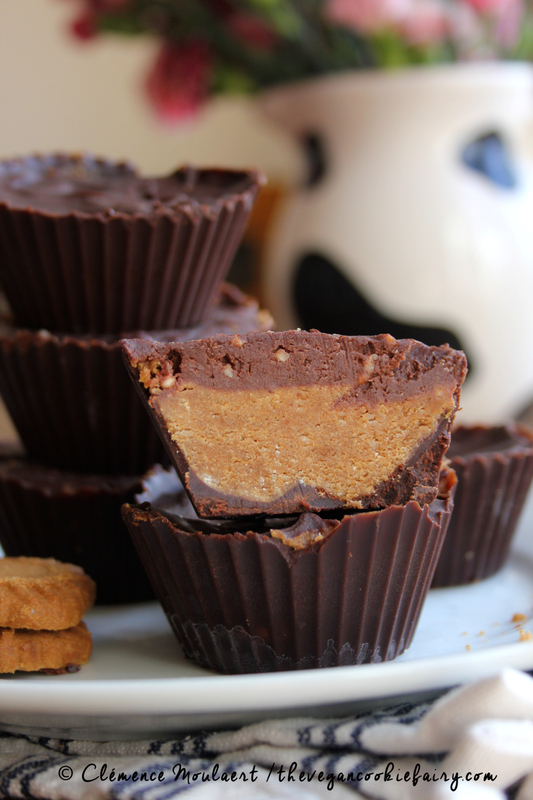 Keep the chocolate cookie butter cups in the freezer for up to a month or in the fridge for up to a week. Thanks, June! It’s much “healthier” than the cookie butter that you get from the shop, too – although it’s still made of biscuits, so I’m not selling it as a health food, mind you! I thought it was too good to be true! I’ve been looking for a good biscuit for years that is vegan and organic as everything in the U.S. that isn’t labeled certified organic is GMO (genetically modified). I haven’t found one yet. Your cookies have vegetable oil and fat (guaranteed that it is palm oil that is deforesting Indonesia and Malaysia and wiping out the Orangutans!) Palm oil has a bad name so it is hidden by inventing a number of names so people don’t know it is actually palm oil, and vegetable oil is just one of many. Also, the sugar syrup is likely GMO, especially if it’s in the U.S. These cookies are not organic and are not what we should eat. Maybe make your own teabiscuits? Or, in the U.S. we have vegan/organic vanilla Oreos that might work if the cream filling was scrapped off! 1. I never said these were organic, palm-oil free or GMO-free. 2. If you want a GMO-free, palm-oil free Speculoos biscuit, you can – as stated in the blog post – make them yourself at home. 3. I don’t let anybody tell me what I should or should not eat. By the way, I’m new to your blog and love your recipes! Thanks for your lovely comment, it’s great to welcome you to the community!